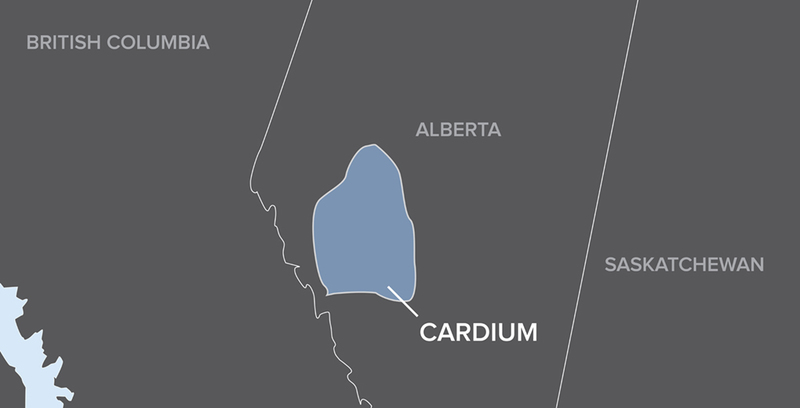 Located in west-central Alberta, the Cardium formation is a sandstone deposit encased in thick shale and is the main producing interval of a number of different oil fields, including Garrington, Brazeau, Willesden Green and Pembina. Pembina is the largest conventional oil field in Canada and is estimated to contain 9.3 billion barrels of original oil in place. While the field was discovered in the 1950s, and has been exploited ever since, only 14% of the light gravity crude oil has been produced. This has made the Cardium one of Canada’s hottest oil plays. Exploration in the Cardium formation is targeting oil reserves within the unconventional area of the formation, as the sandstone deposits have largely been exhausted. This has created a demand for technology to stimulate the tighter zones of the formation. The StackFRAC® system, an open hole multi-stage stimulation technology, has been used in the Pembina field with great success. Along with continued innovation in fracture fluid technology and methodology, the StackFRAC system has become the preferred method of completion in the area. In an effort to reduce costs and increase efficiency, a major operator in the area chose to use a cemented-back open hole monobore design to complete their well. This required the use of a stage tool in order to place cement above the 22-stage StackFRAC completion to the surface casing. However, stage tools can introduce debris into the system when proper clean-out procedures are not followed, which can have a detrimental effect on stimulation operations. After the cementing operation, the stage collar was milled out using jointed pipe. A clean-out procedure then took place in order to remove any remaining debris. During the final step of the clean-out procedure, 1,640 ft of the jointed pipe disconnected and fell down the well. In addition, the jointed pipe collar, which has an outside diameter (OD) of 3.06 in. also fell through the well. The collar fell to stage 17 and impacted with enough force to shift open a 3.00 in. FracPORT™ sleeve. When the collar was retrieved, damage was observed where it had impacted the ball seat and opened the FracPORT sleeve. Due to the premature opening of the FracPORT sleeve, pressure integrity in the liner was lost. Stimulation operations could not be completed without well intervention. The breach in the liner resulted in a loss of fluid and an inability to increase hydraulic pressure, which is required to open FracPORT sleeves and initiate a fracture. In order to stimulate the lateral, the open FracPORT sleeve was sealed off by installing an X-SPAN® Owen Casing/Tubing Patch (Figure 1). Before this could take place, six ball seats, including the one in the FracPORT sleeve which prematurely opened, had to be milled out. Caution was taken during the mill-out operation to ensure that another FracPORT sleeve was not opened. After milling operations were completed, a clean-out trip was performed and a drift run completed to ensure there was not an inside diameter (ID) restriction. The patch has a running OD of 3.658 in. and was placed on depth by tagging the lower intact FracPORT and pulling back into position. The 20 ft patch was placed across the FracPORT sleeve. Once the patch was properly positioned, a hydraulic setting tool was used to set the casing patch. It has a burst rating of 9,000 psi and creates an ID restriction of 2.992 in. in casing that is 4.5 in. and 13.5 lb/ft. After installation of the casing patch, pressure integrity in the well was maintained and stimulation operations were able to proceed. The first 16 stages were stimulated using the ball-drop method in one continuous pumping operation. Since the patch had an ID of 2.992 in., a specially designed ball with a reduced OD of 2.96 in. was dropped and seated on the 2.875 in. ball seat. The remaining five stages were successfully stimulated using abrasive-jet perforating and an isolation tool assembly. Packers Plus worked closely with the operator to ensure the well was successfully completed. As the innovator of open hole multi-stage systems, Packers Plus is committed to developing technical solutions to completion challenges, including wellbore intervention.